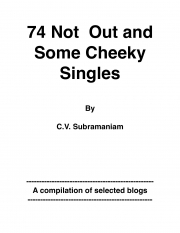 Description of "74 NOT OUT AND SOME CHEEKY SINGLES (eBook)"
This book is a compilation of 50 blogs which I had published - short pieces of writing on a variety of subjects from cricket to capsicum Pakora, from Mambazha pulisseri to Mock at Sorrow, from what is in a name to Sachin Tendulkar to Steve Jobs, cataract catastrophe to corruption, some personal experiences and so on. In the opening piece '74 Not Out' the author, at the age of 74, tries to see him as a cricketer with his own imaginative hittings of fours and sixes. What follows is a whole basket of 'quickies ' - the so-called 'cheeky singles', crisp, short, interesting, enjoyable 'quick reads' many of them spiced with some doses of humor. These pieces have been appropriately grouped into four sections (as Power Plays in cricket) viz. 'On Cricket, 'Something Delicious for You', 'Personal Experiences' and 'General Topics '. The book as a whole, provides mind-refreshing reading, in simple, easy-to-understand-and-appreciate language and is written for all those who love reading. Many of these blogs have received appreciations and comments from readers. Officer on Special Duty, Science Advisory Council to Prime Minister, and Chief Personnel Officer, CDAC. His publications include two books: Human Resource Management and Seeing Opportunities Through Your Mind, and over 70 articles on S&T, HR, Management etc, in leading newspapers/magazines. Reviews of "74 NOT OUT AND SOME CHEEKY SINGLES (eBook)"
though. The anecdotes from your life are filled with wisdom. 74 NOT OUT is easily read and not strains your senses. It is suitable for readers of all ages. Its is divided into four main sections Power Play One: CRICKET, Power Play Two: Something Delicious for you, Power Play Three:? Personal Experiences and Power Play Four: General.